When did you last pause to enjoy the world and the people around you? “It’s a Wonderful World”—the theme of our summer camps this year, was designed to encourage campers to explore and be amazed at the wonder of creation. The camps not only give the children a fun time but also bring their parents, who care for them 24/7 with little support from the community, some respite from their everyday challenges. 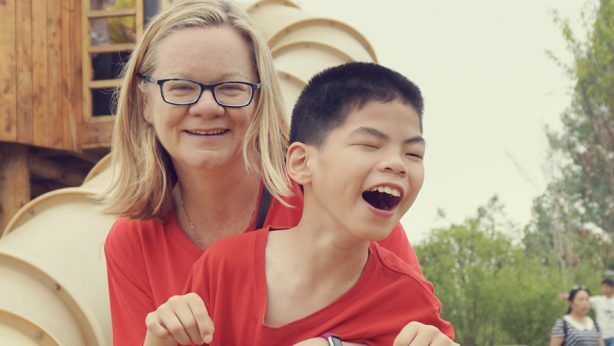 In China, children with disabilities are often isolated from the community. Schools are rarely wheelchair-friendly so these children are deprived of learning opportunities even if they are intellectually able. Due to extremely limited interactions between people with and without disabilities, misunderstandings and a fear around disability are common. The sensitivity and willingness to see beyond disability to understand the person have become a rare treasure nowadays. At ICC, we strive to create opportunities for the two groups to mix together, learning to care for each other and to accept and appreciate the differences among them. In the first camp, children with a low level of disability were joined by a group of local school children without disabilities, who were amazed at how capable their new friends were. Besides playing games and enjoying some pool time together, the children learnt through doing interesting science experiments. There was another camp for children with higher levels of need who require much greater assistance to participate in daily activities. It was the first time we held a camp specifically for this group. Overall, as the camps progressed we saw growing confidence in these children. Some of them have gone from being shy to being confident enough to even get up in front of other campers and give a performance! Children were shown how to build a volcano with lava bubbles pouring out of it. There was much laughter at the erupting lava! With the encouragement and help of our volunteers, 12-year-old Xuanxuan, who has cerebral palsy and had never gone swimming before, has overcome her initial fear and fallen in love with swimming! Feedback from the participating families was very positive. One mum who has a high needs child was grateful for the opportunity for her daughter to attend the camp and for the much needed respite she, as a full time caregiver, received. She has been struggling with a sore back so it was good that she could rest for a few days without having to lift her child. The camp brought many parents encouragement and strengthened their resolve to not give up on their children. The Red Cross and a local hospital sent doctors and nurses to look after any medical needs that arose during the camp. They were very moved and said it was the first time they had heard about this type of outreach to families. They felt that the camps held great meaning. Other local volunteers also appreciated the opportunity to connect with these special children. It was wonderful to see blossoming friendships between the volunteers and the campers!